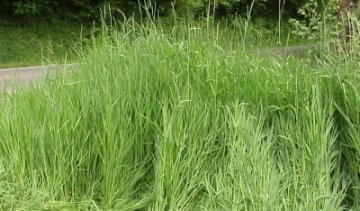 One of the main goals of the project was to remove invasive exotic plants and replace them with native riparian vegetation. One of the first tasks required for this effort was the mapping of existing trees, shrubs, and herbs. 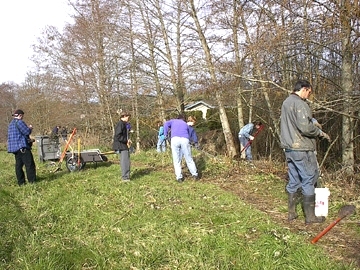 All of the trees along the Jefferson Elementary side of Dixon Creek were identified and mapped (see Tree identification and mapping) and a general census of shrub and herb plant cover was conducted by community volunteers. It was determined that the vast majority of existing trees were already native species. 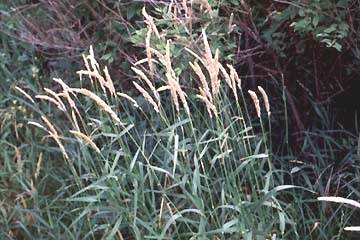 For the shrub and herb plant cover, however, there was a significant amount of the invasive exotic Himalayan blackberry and some reed canarygrass present. 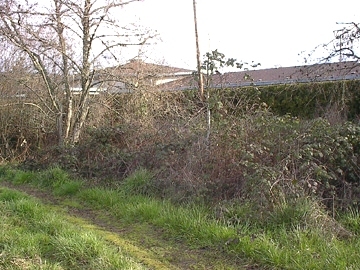 There have been efforts made in the past to reduce the amount of invasive exotic species along this segment of Dixon Creek, but lack of continued maintenance allowed the invasive plants to grow back and crowd out the native plants. Planting scheme from 1994. Click on the map to view or download a larger version. 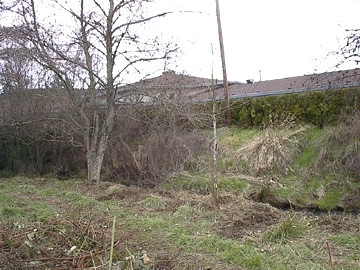 Considering the past revegetation efforts and current compromised habitat quality for all of Dixon Creek (see Other Dixon Creek study results), it was decided that no existing trees would be removed to ensure cooling of the creek from shading, only invasive exotic plants would be removed to reduce the chance of possible stream bank erosion and increase in creek sedimentation, no chemicals would be used to remove or manage invasive vegetation, and a source of continued maintenance work would be critical for long term success. The locations for planting new native trees, shrubs, and herbs was determined by Jefferson Elementary students and community volunteers. There was an upper bank area along some portions of the creek that was used to plant trees and the shrubs and herbs were planted in areas (like shaded or open) that might help the new plants survive. Plastic plant sleeves and bark mulch was placed around each new plant to help protect the plants from grazing and drying out. 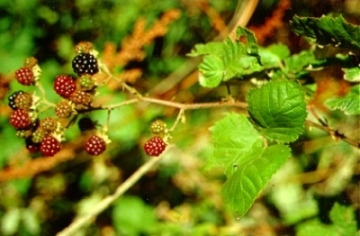 The Oregon Watershed Enhancement Board provided $3,665 worth of native bare root trees and shrubs to use in the plant revegetation work. There have been a number of work parties (see Work parties and presentations) where Jefferson Elementary students and parents, Scout Troop 163 members, the Corvallis Public Works Department, and community volunteers have removed invasive exotic plants, planted new native plants, and maintained the area.